Hermann Spielwaren Classic Music Composer Series Teddy Bear with musical movement and beautifully embroidered paw-pads. 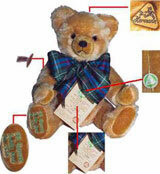 15.75 inch, fully jointed, Musical Teddy Bear made of Mohair, and traditionally filled with excelsior. He comes wearing a wig on his head, and dressed in his white shirt and red vest. Vivaldi's music box plays one of his violin concertos, La Primavera from The Four Seasons. Antonio Vivaldi is holding a violin and bow. Hermann Spielwaren create beautiful Mohair Limited Editions in Coburg, Germany in the traditional style. They have produced teddy bears for three generations. The old trademark of Max Hermann, the green triangle and the portrait "bear with the running dog", is still very evident on everything produced by the HERMANN-Coburg Company. Limited Edition Composer Series Bear - European Limited Edition of 500.